Apple pie has long been the embodiment of Americana. Except, well... I'm not a huge fan of fruit pies. And I don't make good pie crust. So, when I decided to make a dessert for last night's family Fourth cookout, I decided to seek inspiration elsewhere. Nothing's more American (and, for that matter, Southern) than Coca-Cola, right? 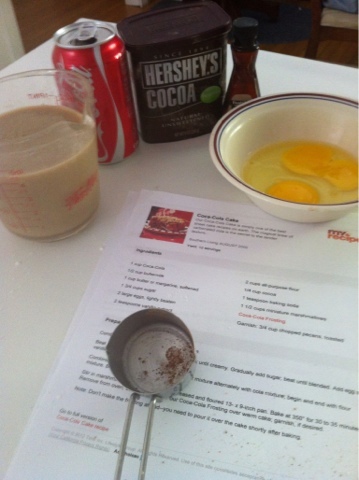 So, I decided to make a Coca-Cola cake. I'd heard many times that it was a classic recipe of my late great-aunt's, but I'd never actually sampled it. So, I tried a recipe from Southern Living, which is, of course, the bible for such things. The cake turned out well, if a little gooey and indulgent. I'm always fascinated to try recipes from bygone eras. Boiled frosting and mini-marshmallows are such a throwback to Sixties cookery. I'd never used either before. Nor had I cooked with soda. But, the result was really fun and, I have to say, delicious. It was also really nice to hear comparisons to my Great-Aunt Marie's cooking; she was such a wonderful, gracious, vibrant lady. She and my Great-Uncle Ed lived on the Atlantic Coast of Florida in the Eighties and Nineties. 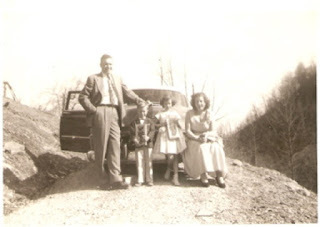 They spent their summers here in Kentucky; we were always so excited when they would arrive, bringing them, their curiously Florida-bright polyester ensembles, their ubiquitous chihuahua, and a van-load of presents for us kids. Now that we're all adults, my brother and cousin frequently joke that I've become the Aunt Ree of our generation whenever I don a particularly loud Lilly Pulitzer dress, adopt yet another dog, or wear one of her vintage brooches. I sure hope they're right. At least I know that I have one of Aunt Ree's signature recipes down pat.